Kicking Off The ‘7 Faces of A New Hire’ Onboarding Series. It is always a bit of a gamble isn’t it, starting a new job? You want it to be your best decision ever but you are anxious that it could be your worst mistake. When you desperately want everything to be great, you are just a little more disappointed when things don’t quite hit the mark. 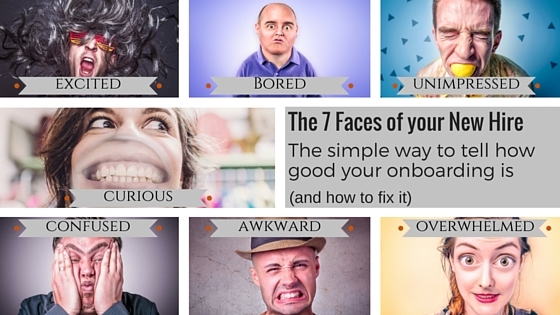 So when your new hire joins you, their emotion levels are high. They would have spent a lot of time imagining what this new job will be like. Anticipation means that they will scrutinise everything that happens and it will be judged against the dream like vision they have created in their head. That makes it tough for you as the hiring manager. High expectations are always hard to live up to. So how do you know how you are doing? Well a daily catch up in those early days is imperative to catch any concerns. I talk about that here so we’ll take that as a given. But also just take some time to use your eyes. Faces and body language can give away a lot. This blog post kicks off a series looking at the seven common emotions of a new hire to look out for. Some reflecting that you are doing a great job, others that there may be, well, room for improvement. 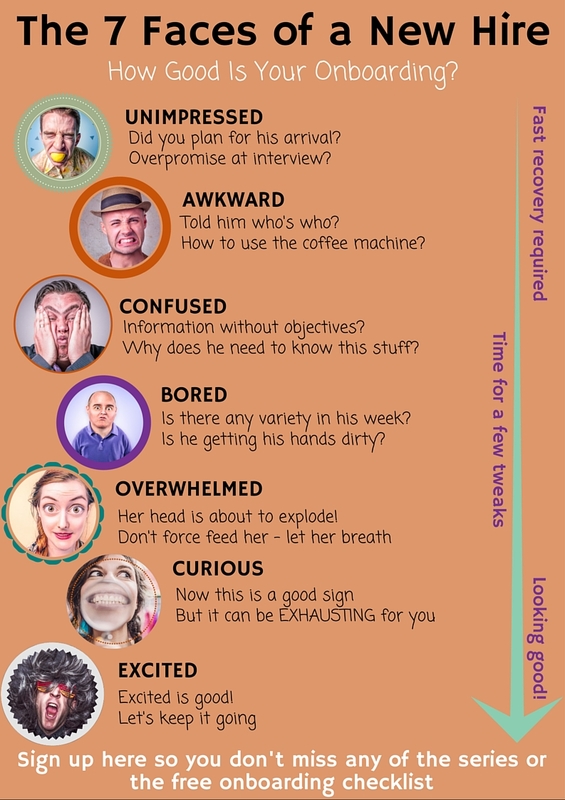 So in the next seven posts coming out to you over the next two weeks, we’ll drill down into the emotions to look out for and how to enhance or avoid them in the future. Phew, we’ve got a lot to get through. So we are kicking off on Thursday with the UNIMPRESSED new hire. You know when you do something wrong and instead of someone shouting they just have that disappointed look on their face. Ouch – that’s twice as bad, right? Or maybe it’s not your fault. Maybe his expectations were just too high? Either way, we look at how to stop that happening. And how to bring it round if it already has. And at the end of the series, there will be an actionable checklist for you to download to help you plan your onboarding. We need to aim for faces bursting with excitement every time! Make sure you don’t miss any of the series. Click here to get them all delivered to your inbox. UNIMPRESSED: What to do when your new hire is unimpressed?